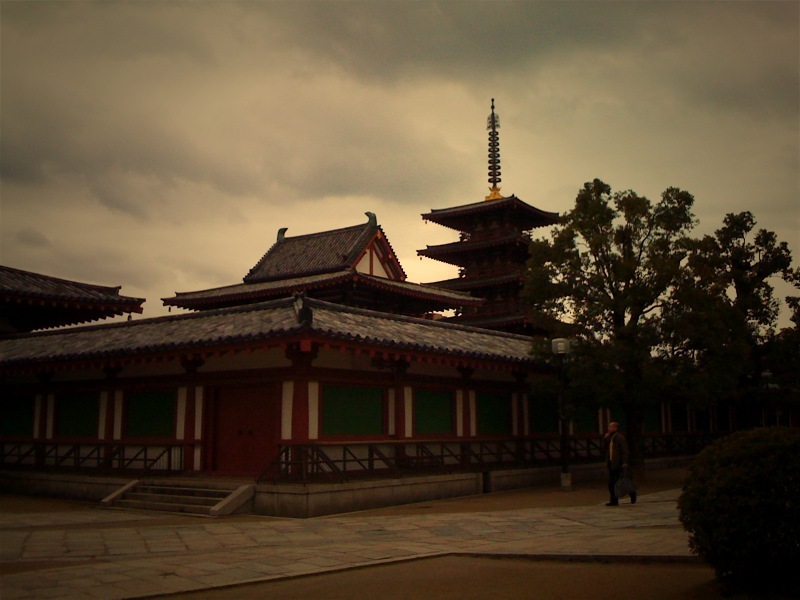 Shitennouji was Japan's first and oldest Buddhist temple. It's long history can be found on Wikipedia and it is easily accessible by JR trains or subway. Shitennouji is easily accessible by JR, Kintestu and subway trains. If going by subway, take the Tanimachi Line* or Midosuji Line* to Tennoji Station. You can also exit at Shitennoji Mae Yuuhigaoka Station on the Tanimachi Line. On the JR trains, the station is also Tennoji, but on Kintetsu, you have to get off at Osaka Abenobashi Station. *NOTE: The colors also represent the color of the train lines i.e. Midosuji is the red line and Tanimachi is the purple line. In some cases, lines also come in light greens and dark greens, so I will try to denote them when possible. JR trains and Kintetsu trains are NOT color coded. From Tennoji Station or Abenobashi Station, head out to Tanimachi-suji (when exiting from the JR Station, it'll be the big street right in front of the station. You can also exit from the JR Station when using the subway. Kintetsu's station is located on the same side of the street as the JR Station, just a block or so south). Heading north on Tanimachi-suji but on the same side as the station (that means when facing north, you're on the right side of the street), you'll cross Kokudou Number 25 (Route 25) and the temple will be to your right. It's pretty hard to miss because I don't remember there being any buildings blocking the temple gate at the entrance. "During Tanabata in Shitennouji (temple) there will be over 300 stalks of bamboo linked together as a tunnel, and with shining LED lights creating the Milky Way, on display. If you decorate tanzaku (Japanese paper) with wishes and tie them to the tunnel of bamboo, your wishes may be sent to the stars. Also, during the Tanabata festival, there will be a reenactment of a Tanabata Prayer Concert, star gazing and other events taking place. On the 10th, wishes written on tanzaku will be burned in Shitennouji." I know this is terribly short notice, but tanabata is one of the more widely known festivals in Japan, so I thought I'd share some info for anyone visiting the kansai area during that time!